When Naficy purchased her home in 2011, it was a standard suburban ranch on six acres of forested land overlooking a ravine. 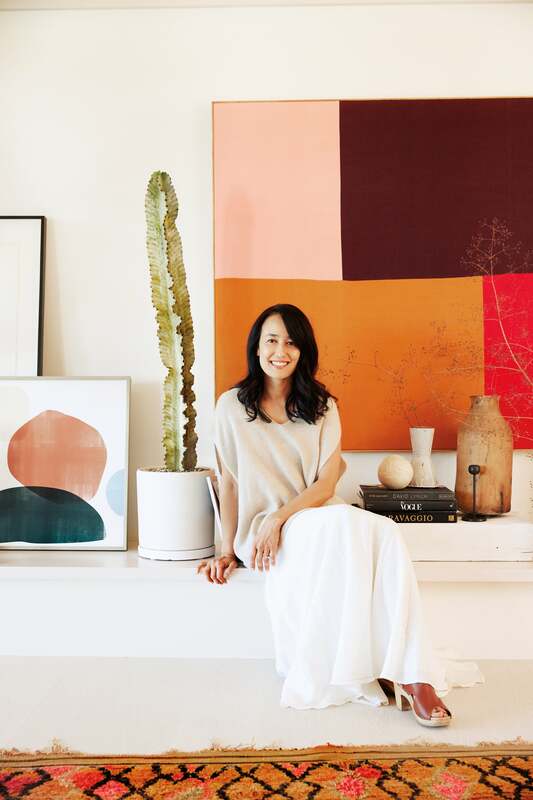 She enlisted the help of designer Maca Huneeus to transform the nondescript structure into a neutral, Scandinavian-influenced backdrop for her colorful trove of art and antiques. With a warm-minimalist aesthetic in mind, they vaulted the ceilings, opened up the layout, and introduced a palette of white walls and pale wood floors. Salvaged architectural details and well-worn vintage textiles cozy things up: Beams are 18th-century barnwood from Vermont and Maine, and many of the doors are repurposed, with one dating back to the 17th century. In the den, an ottoman is upholstered with a North African carpet, while vintage Moroccan rugs add color and warmth throughout the house. “Very old materials bring that patina and character that you can’t easily get with new things,” says Naficy, whose collection of hand-thrown ceramics fills display shelves and peppers many surfaces. With art, as with furnishings, Naficy is all about the mix. In the living room, a screen print from Robert Motherwell’s Africa Suite—a series of bold black-and-white images—leans on a gallery ledge next to an antique Tanzanian sculpture. Nearby, a grouping of contemporary works from Minted includes abstract prints alongside figurative photography. From the art to the upholstery and pillows, a palette of ochre, rust, and wine “reminds me of my 1970s childhood,” Naficy says. That need for a moment of zen is understandable: Her weekday schedule is filled with travel, endless meetings, and the demands of parenthood. More than anything, she says, the Calistoga getaway represents an opportunity to reconnect and relax. The family spends time between the vegetable garden, the pool, and the deck, reading, listening to music, and cooking. Naficy’s in-laws often make the trek south from Seattle for birthdays and other celebrations. “The house is a cocoon of warmth, inside and out,” she says. Art collecting, according to Naficy, shouldn’t be bound by rules. “It’s about falling in love with a piece and having something that you care about,” she says. But when it comes to displaying your treasures, there are certain maxims to consider. Here, she outlines her strategy. Your home isn’t a museum, so resist the urge to put everything behind glass. Leaving an oil painting or textile unframed “lets the rawness in the texture come through,” notes Naficy. Beware of things that go bump in the night. “I don’t like the idea of art hanging above the bed in earthquake territory,” says Naficy. Rather than leave the space unadorned, she turns to murals, either papered or painted directly on the wall. This story originally appeared in the Winter 2018 issue of Domino, titled “Calm, Cool & Collected.” Subscribe to be the first to receive each issue!